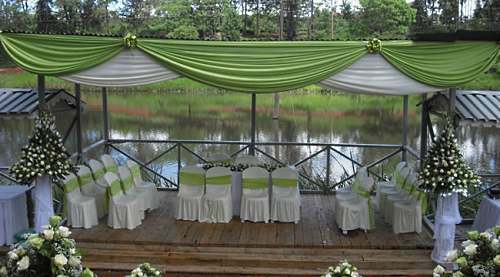 Zen Garden is the ultimate Wedding Venues in Nairobi, captured in the scenic surroundings of Nairobi’s Spring Valley. The sheer beauty of the location, uncompromised quality of food and high level of service, attracts customers to the restaurants and conference facilities available at Zen Garden. The 2 ½ acre space holds three spacious entities; two restaurants and one conference facility, each boasting a Zen surrounding inspired by the urban gardens of Asia. The Zen Square conference rooms have been newly refurbished with 4 unique meeting rooms; the Bamboo Oriental Restaurant, an elegantly adorned fine dining restaurant and the Jade-Coffee & Tea House, an all-day, all-occasion casual restaurant. Evergreen Park and Garden is a recreational site situated along Iambus Road approximately 6 Km from the Muthaiga Golf Club. The area covers about 10 acres of dry land and 2.5 acres of water surface in form of a dam. The dry land is covered by well groomed Kikuyu and Zimbabwe green grass and well shaded fruit trees. The land is well terraced and slopes towards the dam ultimately providing a very scenic water front garden with a serene and relaxing atmosphere. The Park is ideal for Wedding Venues in Nairobi and outdoor activities such as weddings, picnics, camping, birthday/goat eating parties , office excursions and team building, retreats, school tours among others. Maro gardens is a serene and an exclusive garden for all your party needs. You can have both the ceremony and the reception. Corporate Functions: – cocktails, trainings. Tents & seats & tables: – available. Required services: – limited only by your event; we coordinate as required at cost. looking for a nice garden reception,guest 150-200.very soon. Write us at olarabel.ridgeways@gmail.com for an enchanting place in Ridgeways. Search for OL ARABEL on Facebook and join the group to see more than 400 pictures of past events and set-ups. Karibu Ol Arabel. Hi Ann. We have a fantastic garden under 80-year-old trees, with parking for nearly 200 vehicles in the quiet, leafy Ridgeways neighbourhood. Search for OL ARABEL on Facebook and join the group to see more than 600 pictures of past events and set-ups. Write us at olarabel.ridgeways@gmail.com for an enchanting place in Ridgeways. You may also call on 0722371809.